Clinical decision support systems (DSS) are in widespread use in medicine and have had most impact providing guidance on the safe prescription of medicines,12 guideline adherence, simple risk screening13 or prognostic scoring.14 These systems use predefined rules, which have predictable behaviour and are usually shown to reduce clinical error,12 although sometimes inadvertently introduce safety issues themselves.15 16 Rules-based systems have also been developed to address diagnostic uncertainty17–19 but have struggled to deal with the breadth and variety of information involved in the typical diagnostic process, a problem for which ML systems are potentially better suited. Looking further ahead AI systems may develop that go beyond recommendation of clinical action. Such systems may, for example, autonomously triage patients or prioritise individual’s access to clinical services by screening referrals. Such systems could entail significant ethical issues by perpetuating inequality,25 analogous to those seen in the automation of job applicant screening,26 of which it is said that ‘blind confidence in automated e-recruitment systems could have a high societal cost, jeopardizing the right of individuals to equal opportunities in the job market’. This is a complex discussion and beyond the remit of this article. Outside of medicine, the cutting edge of AI research is focused on systems that behave autonomously and continuously evolve strategies to achieve their goal (active learning), for example, mastering the game of Go,27 trading in financial markets,28 controlling data centre cooling systems29 or autonomous driving.30 31 The safety issues of such actively learning autonomous systems have been discussed theoretically by Amodei e t al 32 and from this work we can identify potential issues in medical applications. Autonomous systems are long way off practical implementation in medicine, but one can imagine a future where ‘closed loop’ applications, such as subcutaneous insulin pumps driven by information from wearable sensors,33 or automated ventilator control driven by physiological monitoring data in intensive care,34 are directly controlled by AI algorithms. Expected trends in machine learning (ML) research: boxes show representative examples of decision support tasks that are currently offered by rule-based systems (grey), and hypothetical applications of ML systems in the future (yellow and orange), demonstrating increasing automation. The characteristics of the ML systems that support these tasks are anticipated to evolve, with systems becoming more proactive and reward driven, continuously learning to meet more complex applications, but potentially requiring more monitoring to ensure they are working as expected. AI, artificial intelligence; DSS, decision support systems. 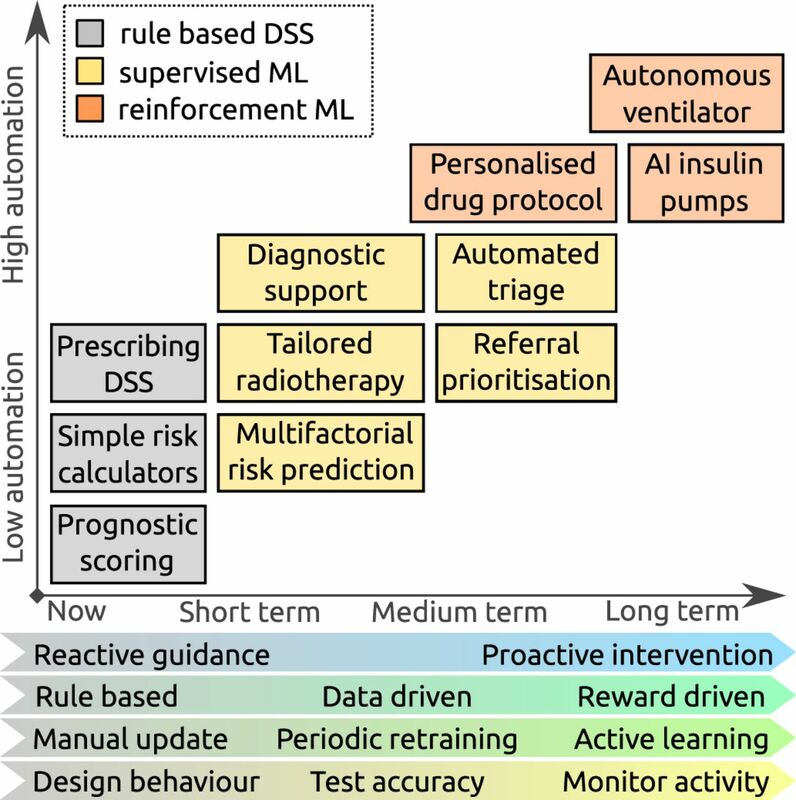 Figure 1 summarises expected trends in ML research in medicine, over the short, medium and longer terms, with the focus evolving from reactive systems, trained to classify patients from gold standard cases, with a measurable degree of accuracy, to proactive autonomous systems which continuously learn from experience, whose performance is judged on outcome. Translation of ML research into clinical practice requires a robust demonstration that the systems function safely, and with this evolution different quality and safety issues present themselves. In an early AI experiment, the US army used ML to try to distinguish between images of armoured vehicles hidden in trees versus empty forests.1 After initial success on one set of images, the system performed no better than chance on a second set. It was subsequently found that the positive training images had all been taken on a sunny day, whereas it had been cloudy in the control photographs—the machine had learnt to discriminate between images of sunny and cloudy days, rather than to find the vehicles. This is an example of an unwittingly introduced bias in the training set. The subsequent application of the resulting system to unbiased cases is one cause of a phenomenon called ‘distributional shift’. A mismatch between training and operational data can be inadvertently introduced, most commonly, as above, by deficiencies in the training data, but also by inappropriate application of a trained ML system to an unanticipated patient context. Such situations can be described as ‘out-of-sample’ input, and the need to cater for many such edge cases is described as the ‘Frame problem’25 of AI. Inappropriate application of an ML system to a different context can be quite subtle. De Fauw et al 7 discovered their system worked well on scans from one OCT machine, but not another, necessitating a process to normalise the data coming from each machine, before a diagnostic prediction could be made. Similarly we anticipate that the system for diagnosing skin malignancy,6 which was trained on pictures of lesions biopsied in a clinic, may not perform as well when applied to the task of screening the general population where the appearance of lesions, and patient’s risk profile, is different. Over time disease patterns change, leading to a mismatch between training and operational data. The effect of this on ML models of acute kidney injury was studied by Davis et al, 40 who found that over time decreasing AKI incidence was associated with increasing false positives from their ML system, an example of prediction drift. In the comparison between ML systems and expert dermatologists performed by Esteva et al, 6 both humans and machines find it difficult to discriminate between benign and malignant melanocytic lesions, but humans ‘err on the side of caution’ and over-diagnose malignancy. The same pattern was not observed for relatively benign conditions. While this decreases a clinician’s apparent accuracy, this behaviour alteration in the face of a potentially serious outcome is critical for safety, and something that the ML system has to replicate. ML systems applied to clinical care should be trained not just with the end result (eg, malignant or benign), but also with the cost of both potential missed diagnoses (false negatives) and over-diagnosis (false positives).43 During learning ML systems assess and maximise their performance based on a measure of accuracy obtained on predictions made from training data. Often this accuracy measure does not take into account real-world impacts, and as a result the ML system can be optimised for the wrong task, and comparisons to clinician’s performance flawed. As humans, clinicians are susceptible to a range of cognitive biases which influence their ability to make accurate decisions.47 Particularly relevant is ‘confirmation bias’ in which clinicians give excessive significance to evidence which supports their presumed diagnosis and ignore evidence which refutes it.25 Automation bias48 describes the phenomenon whereby clinicians accept the guidance of an automated system and cease searching for confirmatory evidence (eg, see Tsai et al 49), perhaps transferring responsibility for decision-making onto the machine—an effect reportedly strongest when a machine advises that a case is normal.48 Automation complacency is a related concept48 in which people using imperfect DSS are least likely to catch errors if they are using a system which has been generally reliable, they are loaded with multiple concurrent tasks and they are at the end of their shift. Automation complacency can occur for any type of decision support, but may be potentiated when combined with other pitfalls of ML described above. For example, given the sensitivity to distributional shift described, the usually reliable ML system that encounters an out-of-sample input may not ‘fail safely’ but continue confidently to make an erroneous prediction of low malignancy risk and not be questioned by the busy clinician who then ceases to consider alternatives. Such recommendation decision support already exists, but in systems whose behaviour is determined by explicitly designed rules. The shift to a data-driven approach introduces a new risk in the situation of a sudden change in clinical practice that requires the DSS to change, for example, a drug safety alert. While the rule-based system can be manually updated, as ML is predicated on the availability of appropriate data, it has the potential to reinforce outmoded practice, and a radical change that invalidates historical practice is difficult to absorb, as there are no prior data to retrain the system with. The need to periodically retrain and evaluate performance in response to technological evolution, new knowledge and protocol changes in medicine requires costly updating of gold standard data sets. On the other hand, a related potential problem could arise in ML systems that are very frequently updated, and particularly those that continuously learn. Suppose a system predicts a prognosis, this may in turn influence therapy in a way that reinforces the prognosis and lead to a positive feedback loop. In this scenario, there is a self-fulfilling prediction, which then may be further reinforced as the ML system learns. Unsafe exploration: As part of its continuous learning, the system may experiment with the dosing of heparin to try and improve its current behaviour. How do we set limits to prevent dangerous overdosing, and define what changes in strategy are safe for the system to ‘explore’50? Unscalable oversight: As the system is learning new strategies for heparin management for novel patient groups, the management strategies it proposes require inconveniently frequent and expensive aPTT measurement. Developing AI in health through the application of ML is a fertile area of research, but the rapid pace of change, diversity of different techniques and multiplicity of tuning parameters make it difficult to get a clear picture of how accurate these systems might be in clinical practice or how reproducible they are in different clinical contexts. This is compounded by a lack of consensus about how ML studies should report potential bias, for which the authors believe the Standards for Reporting of Diagnostic Accuracy initiative52 could be a useful starting point. Researchers need also to consider how ML models, like scientific data sets, can be licensed and distributed to facilitate reproduction of research results in different settings. Has the system been tested in diverse locations, underlying software architectures (such as electronic health records), and populations? How can we be sure the training data matches what we expect to see in real life and does not contain bias? How can we be confident of the quality of the ‘labels’ the system is trained on? Do the ‘labels’ represent a concrete outcome (‘ground truth’) or a clinical opinion? How has imbalance in the training set been addressed? Is the system applied to the same diagnostic context that it was trained in? How is the system going to be monitored and maintained over time to adjust for prediction drift? Does the system adjust its behaviour (‘err on the side of caution’) where there are high impact negative outcomes? Can the system identify ‘out of sample’ input and adjust its confidence accordingly? Are the system’s predictions interpretable? Does it produce an estimate of confidence? How is the certainty of prediction communicated to clinicians to avoid automation bias? How can it accommodate breaking changes to clinical practice? What aspects of existing clinical practice does this system reinforce? As with all clinical safety discussions we need to maintain a realistic perspective. Suboptimal decision-making will happen with or without ML support, and we must balance the potential for improvement against the risk of negative outcomes. The authors thank David Chalkley, Deputy CCIO & IT Clinical Safety Lead, TSFT, for comments that greatly enhanced this article.
. Predicting risk of suicide attempts over time through machine learning. Clin Psychol Sci 2017:1–13.
. Optimal medication dosing from suboptimal clinical examples: A deep reinforcement learning approach 23. In:2016 38th annual international conference of the IEEE Engineering in Medicine and Biology Society (EMBC), 2016: 2978–81.
. Concrete problems in AI safety. arXiv [cs.AI]. 06565, 2016.
. When Training and Test Sets are Different: Characterising Learning Transfer. In: Lawrence CSS , ed. Dataset shift in machine learning. MIT Press, 2013: 3–28.
. Machine learning: the high-interest credit card of technical debt. 2018. Available: https://research.google.com/pubs/pub43146.htmlhttp://citeseerx.ist.psu.edu/viewdoc/summary?doi=10.1.1.675.9675 [Accessed 5 Mar 2018].
. Training models with unequal economic error costs using Amazon sagemaker. AWS machine learning blog. 2018. Available: https://aws.amazon.com/blogs/machine-learning/training-models-with-unequal-economic-error-costs-using-amazon-sagemaker/ [Accessed 19 Oct 2018].
. Auditing black-box models for indirect influence. arXiv [stat.ML], 2016.
. Intelligible models for healthcare: predicting pneumonia risk and hospital 30-day readmission. In:Proceedings of the 21th ACM SIGKDD International Conference on Knowledge Discovery and Data Mining. NY, USA: ACM, 2015: 1721–30.
. Engineering safety in machine learning. In:2016 Information Theory and Applications Workshop. ITA, 2016: 1–5.
. Systematic errors in medical decision making: judgment limitations. J Gen Intern Med 1987;2:183–7. Contributors All authors discussed the concept of the article and RC wrote the initial draft. KTA, JD, TE, MP and LG commented and made revisions, DC critically reviewed the draft. All authors agreed with the final manuscript. RC is the guarantor. Funding This article was funded by Engineering and Physical Sciences Research Council and the grant number is EP/N014391/1.